Dear Baliks, we have the honor to invite you to the 3rd event of an unique "Back to Armenia" cuisine project to support restaurateurs – repatriates, which will take place on March 1st, at 19:00 in La Cucina Restaurant, Yerevan. 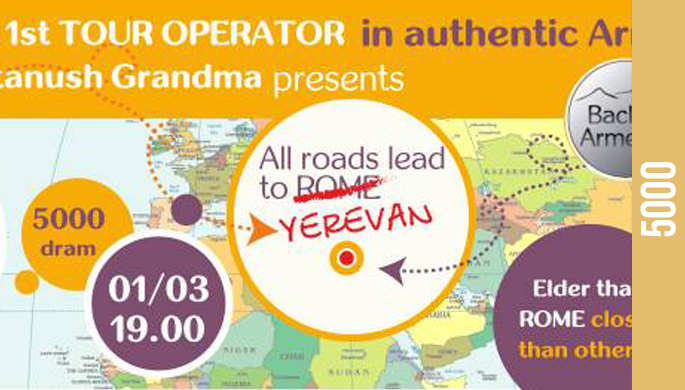 A project by Vartanush Grandma & Co - tours to authentic Armenia and more, realized with information support of Center for Strategic Initiatives, has been created specially in support of the ethnic Armenians, who came back to their Homeland. Every month "Grandma" is to bring together a number of guests for a cooking master-class and the best dishes tasting in the most popular and renowned restaurants of the city, opened by repatriates. Welcome drink from the well known alcoholic Armenian brands, fair business talk with the founders of the restaurants about their return to Armenia, new acquaintances and contacts – meetings within the "Back to Armenia" project are for sure to be interesting and productive. The project's purpose is a removal of a local gastronomy on essentially new level, expansion of culinary interests of the capital and promotion of restaurants. Besides, "Back to Armenia" is the project to motivate and inspire, to illustrate a success story of Armenians, who returned home, started everything from straight and found themselves in this country. We are happy that our 3rd event will be held in La Cucina Restaurant – the place resembling real Italian fairytale.